In a WebSphere application server (WAS), a node contains one or more application servers (aka JVMs). In IHS, a node contains the web server. There are two types of nodes - a managed node and an unmanaged node. A managed node is a node that contains an application server. A managed node has a node agent or administrative agent to manage its servers, and an unmanaged node does not. Adding nodes to a network deployment manager allows you to control certain things on the node. 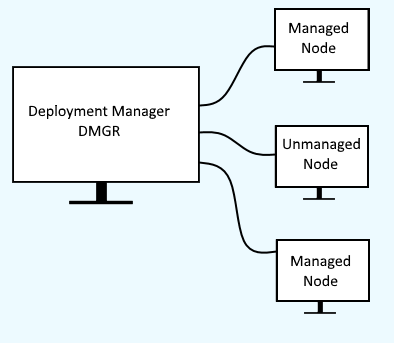 Adding a node to a dmgr is known as "federating a node." For example, you can start or stop the application server, start or stop the web server, start or stop an application, and deploy a new application to the application server. You will run this command from the server that contains the node that you want to add to the deployment manager. Only user account that have the Administrator role are permitted to run the addNode command. In this example, "example.com" is the hostname of the deployment manager, and 8879 is the SOAP port of the deployment manager. It is usually best to use the -includeapps options, to ensure that the applications in the node are included, and that the correct version of the app is included. There will be a prompt to provide a username and password. Use the username and password of the deployment manager. There will be another prompt to provide a username and password. Use the username and password for the node. By default, the application server will be restarted when it is federated into the deployment manager. The -noagent option can be used to not restart the application server. Be aware that this will restart the remote application server. Sign into the network deployment manager (dmgr) web console. In the left, expand System Administration and select Nodes. To add an application server node, select Managed node. To add some other type of node, such as an IHS web server, select Unmanaged node. If adding a Managed node, enter the hostname, port, username, and password of the remote node, check Include applications, and select OK. If adding an unmanaged node, enter the hostname of the remote node and give the unmanaged node a name. 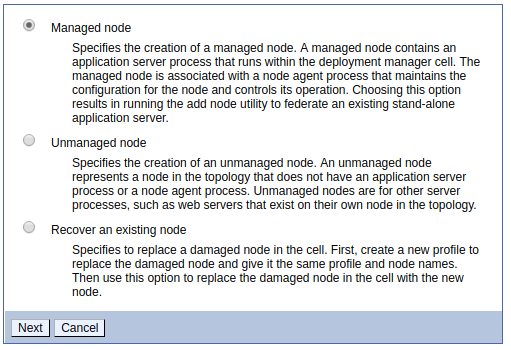 In this example, there are 3 managed nodes (node01 node02 was1CellManager1) and 1 unmanaged node (IHS). Notice that only managed nodes display a status and can be synchronized. In the left panel, expand System Administration and select Nodes. Checkmark the node you want to remove and select Remove Node. You will run this command from the server that contains the node that you want to remove from the deployment manager. Only user account that have the Administrator role are permitted to run the removeNode command. This will stop the node agent, and the WebSphere application servers (aka JVMs) in the node. There will be a prompt to provide a username and password. Use a username and password of a user that has the Administrator or Operator role on the deployment manager. Checkmark the node you want to remove and select Force Delete.